Douglas fir trees (Pseudotsuga menziesii) are also known as red firs, Oregon pines and Douglas spruce. However, according to Douglas fir information, these evergreens are not pinesnor sprucenor true firseither. But they are tall, beautiful conifers native to the Pacific Northwest. For information about growing Douglas firs and tips on Douglas fir tree care, read on. Douglas fir information mentions two species of Douglas fir, the coastal variety and the Rocky Mountain variety. Both are evergreen, but coastal Douglas fir trees are taller and grow faster. The tree’s native range spreads from New Mexico’s Rocky Mountains to the Gulf of Alaska. You’ll find the biggest Douglas firs in the landscape along the wet Pacific coast. Douglas fir is a big tree that grows to over 120 feet when mature. The straight trunk can grow to four feet in diameter and sometimes even twice that wide. The trees are long lived as well. When you are planting a Douglas fir tree, keep in mind that these giants often live 800 years. Douglas firs in the landscape are elegant and attractive. The tree’s form is a tall, slender triangle, and young firs are often used as Christmas trees. There are also many dwarf varieties available to the home gardener. In forests, Douglas firs drop their lower branches, but in the open, their spread can exceed 20 feet. 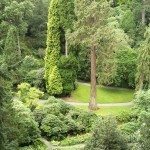 Gardeners appreciate Douglas firs in the landscape for their green-blue needles. Their arrangement on the twigs look like bottlebrush. Those growing Douglas firs will soon find that the cones are egg shaped and up to four inches long. Before you start growing Douglas firs, you’ll need to find a good planting location. They grow best in areas with cold winters and hot summers in U.S. Department of Agriculture plant hardiness zones 4 through 6. When you are planting a Douglas fir, be sure to site the tree in an area with excellent drainage. Even the best Douglas fir tree care will not enable this evergreen to thrive in poorly drained soils. Douglas fir tree care includes providing irrigation in the summer. You’ll need to water between one and four times each month, depending on rainfall and how the soil holds water. You’ll do best planting a Douglas fir tree in a shady area. Either part shade or full shade will work fine. And be certain that the soil is deep, moist and well drained. Once the tree is established, Douglas fir tree care is minimal. The tree is drought-tolerant and can thrive in areas with only16 inches of precipitation annually.